cooperking.co.uk: This is Not a Knee Play. This is Not a Knee Play. This story was originally published in the first BBC Get Writing Anthology. Your problem is you’re mucky, said head. Shut up head, I said disapprovingly, I don’t have any problems. Head was a head. 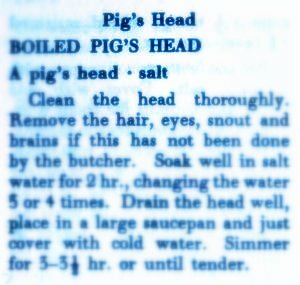 A pig’s head. Which I had got because it reminded me of the one that used to scare me as a kid, laughing at me from the butcher’s window. Oh you’ve got big problems, said head. Massive! You’re mucky, you smell, you never leave the room. I leave the room, I said, not looking at him. I tried not to look at head too much these days, mainly because whenever I did he seemed to be looking less and less like a pig. Not unless you have to, said head. Well you never leave the room either, I said. That’s because I have no body to go with! Well, in a way but it was the kind of joke that’s tinged with sadness because at the bottom of it is the truth. And it’s a sad truth, said head. Head didn’t dwell on it. Why don’t you ever go out though? he asked. Head, I said. I go out when I want to. And anyway I’m not ready yet. You know what a knee play is? He spoke with this European accent, and had done since I mounted him on the broom handle which I’d stuck in a large flower pot. I asked him why once, he said because he was Polish. It was another one of those jokes. Typical that I get the head with a love of word play. I took him off the broom handle when the pressure slowly forced its way through the top of his skull and he slid down the pole and rested on the soil. Even I felt sorry for head that day. But he’d got the voice fixed by then. It was just head’s voice now. Fake Polish. Which is something like Russian combined with Turkish. Enthrall me then, said head. You know I like Phillip Glass? I said. You pretend to like Phillip Glass, but your favourite song is Drumming is my Madness by Ringo Starr. Shut up head. It’s not my favourite song, but I can’t stop listening to it. It’s horrible, but it’s got this hold on me, I can’t let it go. It’s the most disturbing thing I ever heard and I don’t quite know why. It’s meant to be fun, I think. From Stop and Smell The Roses, 1981. Track 3. Well anyway, Phillip Glass wrote this 5 hour opera with Robert Wilson in the 1970s called Einstein On The Beach and it had no break in it, I said. I wouldn’t have made it through five hours, said head. They invited you to wander in and out as you wanted. Pah! said head, you’re so insensitive to my condition. Sorry head. But anyway, in between all the scenes they had these things called knee plays, which were small plays to join the scenes together. Like a knee you see. A joining part between the bones. I see already! said head. And that’s what this is. What you and me are. We’re just a knee play between the important bits, while I get myself up to scratch. Always look after your knees, said head bitterly. So I’ll go out when I’m ready. When will you know you’re ready? I’m not big enough, not strong enough yet. Got to build up my body more, can’t be a skinny little boy anymore. Look at you though! You’re a mountain of a man! You’re carved from oak, you’re a beauty. Not like when I first knew you, skinny little runt. Shouldn’t say runt of course, my dead brother was a runt, but you were a bit. And now, well, you’re a beauty! You’re very kind sometimes head, I said, feeling my pride swell, I had worked hard. Made a vow, wouldn’t leave until I’d become something. Until I could go and take her back, make her wish she’d never gone, new body, new outlook, new way. She’d be sorry. And he’d be insignificant in comparison. Sometimes… said head, then stopped. Well, just sometimes I wish I was loved like you loved her. Love her, I corrected him. Oh head, I said, don’t get like that. You’re loved. You don’t even look at me anymore! head cried. Then he did one of his horrible piggy squeals, the kind that make your toes curl, the kind that make you not guilty for eating bacon. Sometimes I wish I had an apple to shove in his mouth. Once head started squealing I knew he wouldn’t stop, not for a good while. Not until something was done to settle him, but I just couldn’t look at him now. Last time had given me such a fright. And he was shrill. Very. Becoming worse. And then the light bulb shattered. I didn’t have shoes on either, I never work out with shoes on. It was pitch black, which meant that I was bound to cut my feet while scrambling around. Unless I made a leap up onto the bed, but I didn’t want to now, seeing as head was on there. What an idiot he was. The plunge into darkness had stopped his squeal. But then he began to weep. Don’t expect me to feel sorry for you head. You can’t just do that. It’s too immature. I was just upset, said head, between sniffs. You, you, never look at me! Stuck in the black. It may only have been a couple of minutes, but I listened as head’s sniffing slowed down and eventually stopped. And then I couldn’t hear him at all, and after that time quickly began to drag. I hoped one of us would say something soon, I didn’t want it to be me. Finally I heard head’s voice behind me. Would you mind if I ask you a question? he said, his voice meek and sycophantic. I sighed, pretending it was the last thing that I would want. Go on then. I don’t know if you’ll like it, he said. I suddenly realised how cold I was, motionless in the dark, only my track-suit bottoms on. Would have liked to be under my duvet. But that was near head. Oh I don’t know head, I really don’t. Well, you’ve changed so fast, I said, and I didn’t expect that to happen. Look I’m cold okay, I said, I’m going to jump on to the bed because I don’t want to cut my feet open on bits of glass, then I’m going to get under the duvet. Could I go under the duvet too? said head. I’d really rather you didn’t. No offence, I just like my space. Head didn’t say anything, and I was worried he was giving me the silent treatment. But then: Just don’t land on me okay? I’m delicate enough as it is. So I jumped and landed on the bed, relieved that I didn’t land on head. But then I lost my balance somehow and stepped back off, putting my foot in the glass. I felt the skin tear open and the glass go deep. There was no pain at first, but I knew it was coming. I didn’t scream, but head knew something was wrong. Not sure. Stupid. So stupid. How am I going to work out now? Upper body work only, said head. The pain was coming now and I wished there was some light so I could see how bad it looked. I stepped back up onto the bed and lay down. I ignored him, but he was very close now and I wasn’t sure I liked it. I wasn’t sure why head was upsetting me so much at the moment. No wonder he felt neglected. I sat up with my back against the wall, I knew head was right beside me. I pulled my foot up and felt gently for bits of glass. There was a huge shard still sticking out of the ball of my foot. I gently tugged at it, but it was stuck. Ouch. I pulled hard at the shard and it cut my finger as it came out. When you say that I’m changing, what do you mean? This isn’t the time head. I could feel blood ooze between my toes onto the duvet. I just want to know because things change, you know that, that’s all your trying to do is change, but you don’t want me to change. That’s not really fair. Head! I said , I’m in a lot of pain. Yes but this is real pain head. YOU’RE A PIG’S HEAD! I shouted. Head went silent. I carried on trying to pull bits of glass but my concentration wasn’t in it. A pig’s head? said head eventually. Yes, I said, you know that. What? A pig’s head? If you’d have bothered to look at me you’d have seen I haven’t been a pig’s head for some time. I DON’T LIKE TO LOOK AT YOU! YOU’RE NOT THE SAME ANYMORE! I shouted. I could feel the blood pumping out of my foot. It was making me slightly hysterical. I was expecting head to unleash one of his squeals again, but he was just silent. Eventually I realised there wasn’t much more I could do until there was some light. I lay back on the bed. Head didn’t say anything. I was silent for a moment, giving him another chance to reply. Saying nothing was just rude. Still silence. I sat up. What? I said, really annoyed, there was no need for this. I didn’t say anything, said head. Oh don’t be like that. A few more seconds quiet. I started singing quietly to myself: Drumming makes me crazy, ha! Ha! Ha! Ho. And then head’s rant began. When it started I wanted to get off the bed and roll in the glass but I stopped myself, endured it, listened. I do everything your way. You act like I’m unjust but I’m the one stuck here, I can’t do anything unless you want me too. And I might make fun of you occasionally, and annoy you because I tell you you’re mucky, that you need to tidy your room, but generally I just listen to your problems and I do what I can to help. And you don’t even have the respect to look at me! You act so superior, you say YOU’RE A PIG’S HEAD, like that’s my fault. And even when I’m not a pig’s head, you still call me it. Well I can accept that you’re changing, and I can tell you how proud I am, and that you’re going to dazzle her when you go back, but you know what I think? I think you can do better. I mean it’s good that you got in shape, but come on! You don’t need to go back. Times have changed. Stop seeing this as a knee play, start seeing this as your life. I was silent for a while. I’m sorry head, I said, after a while. You’re right I know. But part of me just can’t help but think that I want to change things, that things could have been better. Things are better said head. I’m here now. And you’re important, you really are, I said. I am, said head. It means a lot that you say that. But things are changing, said head, or was it me? I can’t remember. Things are changing, one of us agreed. I won’t be here for long now, said head. I’m changing too fast. If you’d just looked at me. The thing is, you were looking less and less like a pig, I said, and I wasn’t sure that you were, and the implications of that scared me. Everyone’s scared by implications, said head. But what you’ve got to know is that everything has implications. For better or worse, everything you do has implications. When did you become so wise? I said. I’m not wise, said head. I just haven’t got a choice to do anything but study you. Sometimes I don’t know if this is a knee play or a morality play, I said. I think my foot had stopped bleeding, it was a dull ache now. I hoped I didn’t have glass stuck in it. Okay, I said, implications. Implications, said head. I’m going soon. I don’t want to lose you, I said. Want or want not, I’ll be gone, said head. Cope, said head. Very strong. I couldn’t hear the Polish anymore. This has got to end, said head. I don’t want it to. Yet it must, said head. It will, you’ve no choice. And then I felt sad. Really sad, and I let out this piggy squeal. For a long time. Getting more shrill. And head squealed too, high pitched together, until we were both so tired we couldn’t do it anymore. If you’re not a pig then what are you? I asked eventually, when I’d got my breath back. Think, said head, and don’t be scared of the implications. Or be scared, but don’t pretend they don’t exist. I think… sometimes… I said and stopped. I think sometimes I don’t look at you because I know that part of me knows you’re not a pig, but you’re him. Her… her lover. And I don’t want to think about that. Don’t want to think about a human head that I mounted, neck dripping blood, brains squashed by a pole. Too obvious! said head, and there’s no need to be disgusting. You know I’m not him! Him? How can you say that about me, I look nothing like him! If you ever looked at me. I know you’re not actually him, I said. But I think I wanted him to be you, because I hated him so much, I wanted to have power over him. And sometimes I got confused, I thought you really were. Oh, you’re projecting him onto me. I guess, I said. But there’s no need to make it sound like I’m stupid. Sometimes you don’t know you’re doing it. Think harder, said head. What am I? I was silent for a long time.. I thought hard, thought if I dug deep enough inside I’d understand. I don’t know, I said eventually. EXACTLY, said head. You’ve got it, you don’t know and you’re too afraid to find out. I just want you to stop being so afraid. Feel me, you won’t be able to for long. I didn’t like the idea of feeling head, but I knew I had to. I reached out and put my hands on him. Felt his cheeks, cold soft skin, slightly damp. I felt his nose, not a snout, but something like one. His hair. Ears much smaller than they once had been. I reached inside his mouth and felt his teeth, wobbling slightly now as I touched them. I still don’t know what you are, I said. I felt very fond of head at that moment, felt very bad for how I had treated him. I picked him up and held him above me as I lay down, looked into where I imagined his eyes would be. I lowered him to me, touched him nose to nose. I shut my eyes, loved him. Head began to weep again and I felt his tears drip into my eyes. It’s got to end now, said head. It can’t go on. You’re right, I said, pressed my cheek to his. I want to go out in style. It won’t be nice for you. But the only fitting ending. You know it won’t hurt me. Start it now then. Enough of this. I knew the glass shard was beside me on the bed. I put head down and picked it up. I carved through the middle of head first, split him in too. He was much softer than I expected. Then into quarters. Then eighths, sixteenths. He was as soft as jelly. I popped each piece of head into my mouth, swallowed it down whole, which was easier than I expected. I would be very ill, but it was the only way. When he was gone I lay back down and shut my eyes. Waited. Ringo kept playing in my head again and again. I let it play out until there was silence. More waiting, sweating slightly now. I felt my face and couldn’t work out if that was how I expected it to feel. I shut my eyes. Unless you are being plageurised (which is the sincerest form of flattery), I suspect I have seen this, or a version, elsewhere online? heck, cooper, i didn't know you could write. i think i can say confidently that have studied enough lit to recognize this as wonderful work - i loved it. easy read, not too obvious, not too murky. i loved it. bravo. Oh, nice! I thought at first that Head was the love interest's head, but now I have no idea.